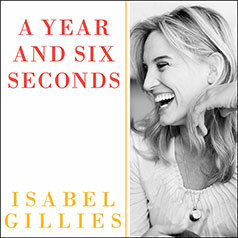 A Year and Six Seconds is the true story of New York Times bestselling memoirist Isabel Gillies's valiant yet bumbling efforts to pick herself up after her husband leaves her for another woman—and of how she stumbles upon true love. A Year and Six Seconds opens on the winter day Isabel Gillies arrives in Manhattan, two young sons in tow, after her husband has left her; she's moving back in with her parents until she can figure out what to do next. In scene after sweet, hilarious scene, Gillies exposes her attempts to feel strong and lovable and to cross items off a staggering to-do list that includes: break down only in front of best friend, not in front of children; get along with parents in tight quarters; find preschool spot for son mid-school-year in Manhattan; receive one great, romantic kiss. She makes lists, she dates, she cries; she and her whole crowded family get the flu; then, just when Gillies least expects it, she falls in love. A Year and Six Seconds is a buoyant, true romantic comedy with a universal human undercurrent reminding us that we can all struggle and stumble, but somehow come out just fine on the other side.